The area of Unawatuna is 150km from Colombo’s international airport. It will take three hours via a car on the congested streets to get to Unawatuna from the airport. The train takes a coastal route to Galle for about the same time as private car but the scenes are more interesting. From Galle take a tuk tuk or local bus to Unawatuna. The bus ride takes 15 minutes and is around 500 rupees. You villa can help arrange pick-up (for an extra fee). Just speak to your friendly Villalet consultant when you book. It’s important to note at this time there are no ATMs is Unawatuna (as of March 2015) but at nearby Galle you’ll find plenty. Currency can be exchanged at Sanasa Bank which is located in the Buddhist temple in Yaddehimulla. It may be a major tourist attraction in Sri Lanka but the beach at Unawantu, on the west coast of Sri Lanka and only 6kms from Galle Fort, has become overdeveloped in more recent times. As a result it has some tacky hotels, cafes and shops, spoiling the once pretty palm-fringed shore. It’s also a centre for water sports so if youre after serenity this isn’t the beach for you. Although some may find it too touristy it’s still possible to find some patches of golden sand and clear water. It’s also well known for its coral, diving and snorkeling. If you prefer somewhere less developed in the area, a 20-minute walk away is White Jungle Beach. Being about 50m long, it tends to get busier at the hottest part of the day so go early to get a free lounge chair and avoid the crowds. It also happens to be near the Japanese Peace Pagoda so it’s convenient to combine the two activities in one trip. 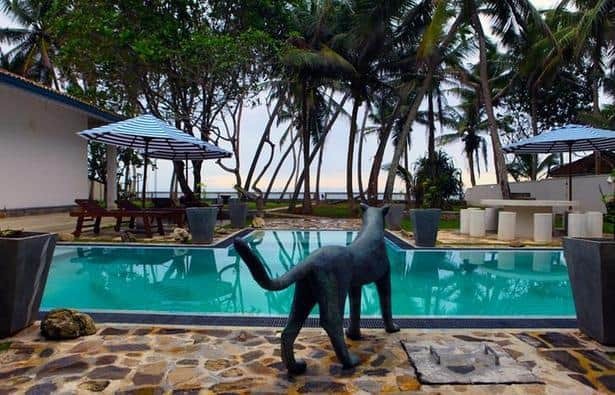 Where to stay in Unawatuna: Villalet has five villa properties in the Unawatuna area, and two villa properties at Mihiripenna Beach (pictured above …the big cat is friendly! ).